This is still a fascinating book, but a sharp dropoff from the previous three. 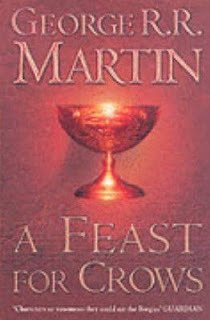 It's as though Martin got to the midway point in his series and realized he had killed off too many major players and had barely delved into several unexplored society. The fix was to abandon several important storylines in favor of a rush job to prop up all sorts of new people, with their own accompanying belief systems and lore. While Westeros feels more full and alive, many of the new characters just aren't as compelling as those who came before, so when Martin kills them off in his sadistic manner it doesn't sting nearly as badly. The TV show avoided the same trap by introducing many of the characters earlier and continuing the storylines that Martin left aside to keep the overall story more cohesive. Everything in A Feast for Crows feels like more of a sketch than a completed portrait, and that carries through to the end, which simply stops an uninteresting sideline rather than casting a shadow toward the future and finishing on a chilling note like his first three books did.